Looking for DC Superhero Girls Toys? The DC Super Hero Girls are the teenage versions of the most famous female superheroes in other words before they had developed their super powers and were all together at Super Hero High. They're united by friendship with a mission to empower kids with the confidence and courage to shine in any situation. The complete line of toys helps kids imagine unleashing their powers. Not sure which toys or heroes are right for your future, fearless, freedom fighter? You don't need x-ray vision to find it, the toy reviews below are here to help. Look through the images below and click on the one that you want to learn more about. You'll be taken to our comprehensive video review and price checker so you can find the right toy and at the best price. Using TTPM's videos is like having your own personal super powers! Mattel's new DC collection of teenage Superhero�s are dressed in their best for a masquerade party. This is the backstory of the iconic DC superheroes before they were superheroes. Just like normal kids they went to high school where they faced a lot of the normal things regular kids face as young teenagers. At Super Hero High these powerful and fearless females have come together as friends to help kids of the world master the sometimes harrowing halls of high school - and very often take on some pretty nasty villains. The DC Super Hero Girls are all about empowering play as kids use the narrative an their imaginations to bring stories to life and imagine themselves as more than equal to any challenges that come their ways. From super strength and speed, to the ability to fly or communicate with plants or animals, every hero has her own unique talents. Wonder Woman is a courageous leader that all of the girls can look up to but still needs her friends' help when it comes to learning about life with mortals. Batgirl is a techno-wizard that never gives up and if she doesn't have a more traditional super power, well, her intelligence and creativity will do just fine. Bumblebee is a social butterfly with super strength and the smarts to match. Even though Poison Ivy is a super genius that can control plants, she's also super shy and without her friends, she would probably spend all of her time in the school greenhouse. Of course the great lesson here is that super powers aren't everything. By embracing and experiencing their hearts, smarts and even their flaws they discover how to be good friends and even better heroes when fighting off the bad guys. This kind of fantasy play is so important for kids. Developing confidence in one's own powers and ability to solve problems finds natural expression in superhero play. That's what makes these characters so great to inspire imaginations. They're cool, to be sure, but they're also very human, and kids can really relate to that as they discover their own hidden powers and abilities while figuring out ways to help others and themselves. Ready to start your super adventure? 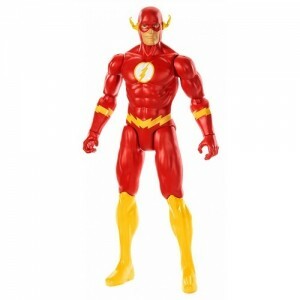 Scroll back up and find the DC Superhero Girls toys that are right for the kids in your world!